Most people may think that a box is just a box just a box, but most people out there do not make their living in the modern boxmaking business—like the venerable family-owned folding-carton converter Ingersoll Paper Box Co. Limited, where quality has been a well-entrenched part of the working vocabulary for over 90 years. Started up in 1922 by Robert Skinner to make ice cream-cones, Ingersoll Paper Box has happily been toiling away as a local, but successful player in the production of paperboard packaging and folding cartons for local CPG (consumer packaged goods) and industrial customers across southwestern Ontario. “Because the cones we made needed boxes for protective packaging, we decided to go into the paper and paperboard business ourselves,” Ingersoll Paper Box president Sarah Skinner told Canadian Packaging during a recent visit to the company’s remarkably tidy, 85,000-square-foot facility built atop the original site’s floor in Ingersoll, Ont., about a two-hour drive southwest of Toronto. As the great-granddaughter of the company’s founder, Skinner readily acknowledges the burden of carrying on a very long and proud manufacturing legacy, but she is confident that a series of well-executed major capital investments carried out by the company in recent years perfectly positions it to keep thriving a very competitive and hotly contested marketplace. “While a rush order in 1922 is the same as a rush order in 2014, we have always sought to implement the latest technologies here at Ingersoll Paper Box to ensure our customers receive the best quality product,” says Skinner, who initially joined the family business in 1994 as part of the sales, marketing and management teams. It has only been in recent years where she has taken over leadership of the company and played a key role to the recent growth and upgrades at Ingersoll Paper Box. 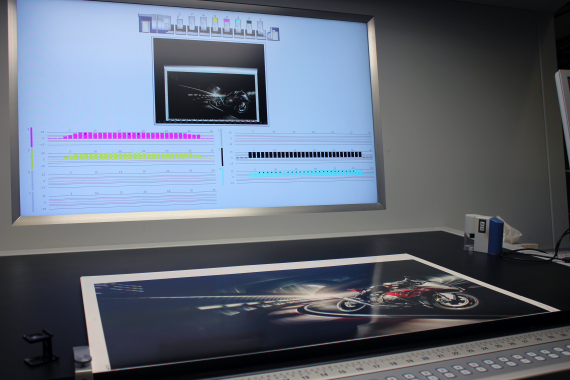 The KBA live-image QualiTronic ColorControl wall screen provides the Rapida 106 press operators with a visual inline color measuring system to ensure print integrity is maintained throughout the run. Photo by Andrew Joseph. This corporate culture of continuous improvement has been well supported over the years under the leadership of her father David Skinner, she relates, who made many keen purchases and capital upgrades that have kept the company viable and profitable, while continuously investing in new machinery to remain highly competitive. Employing about 70 people, Inger­soll Paper Box producing a multitude of straight-line boxes such as reverse tuck, straight tuck and universal bottom; automatic bottoms also known as ‘crashlock’; four- and six-corner boxes; and blister cards. “We also offer services like CAD (computer-aided design), printing, embossing, folding and die-cutting,” says Skinner, citing the company’s wide-range of customers involved in the food, healthcare, pharmaceutical and automotive industries. This past spring, the company made a serious declaration of intent with the announcement that it had just completed the installation of a brand new KBA Rapida 106 7+L ALV2 seven-color, 41-inch fully-automatic printing press, said to be the first press of its kind to be installed in North America. “It was a multimillion-dollar purchase,” Skinner points out. Skinner says that in addition to making everyone in the boxmaking industry take notice, the new press installation not only benefited its customers, also had a great positive impact on the staff morale by demonstrating the management’s commitment to ensure a successful future. As the oldest press manufacturing company in the world, German-based press Koenig & Bauer Group (KBA) custom-builds each press to customer specifications to ensure they get the machine best-suited for their unique processes and their customers. Accordingly, this particular KBA Rapida 106 —a seven-color printing press featuring a coater and UV (ultraviolet) dryer—was completely custom-built for Ingersoll Paper Box’s exact needs and application requirements. Some of the special options on Ingersoll’s new press include a kit just for packaging printers, nonstop operation for longer runs, inline quality measuring systems and special fast cleaning system which are perfect for running spot colors and special coatings. Being able to measure density, spectrally, LAB values (to define absolute colors), dot gain and other key variables makes it a perfect fit for the boxmaker’s high expectations of product quality. Says KBA North America, Inc.’s vice-president of marketing and product management Eric Frank: “In my opinion, it gives Ingersoll Paper Box a unique advantage in the marketplace—it is exactly what they need today and in the future in terms of press speed, number of printing units and automation. “It certainly enables Ingersoll Paper Box to be able to address the packaging needs of customers in today’s market place,” Frank states. 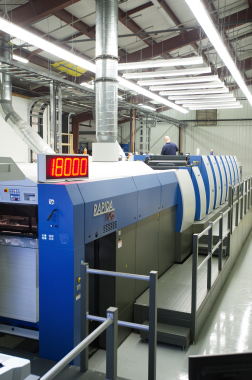 With maximum throughput of 18,000 sheets per hour, the KBA Rapida 106 seven-color printing press with a coater and UV dryer was custom-built to Ingersoll Paper Box’s exact specifications. The KBA Rapida 106 boats speed rates of 18,000 sheets per hour—or a blistering five sheets a second—which Frank says actually exceeds the customer’s current requirements. “The print quality on the press is the best for difficult forms that have heavy solids, fine screens and forms that tend to ghost. The ink train is very reactive so this reduces waste and ensures consistent color during the run,” mentions Frank. The new influx of automation brought by the KBA Rapida 106 has enabled Ingersoll to have extremely short make-ready times, as the press essentially utilizes a one-button set up system, not to mention presets, fast-washing cleaning systems, and a host of simultaneous processes. That one-button set-up system is done via the Rapida 106’s ErgoTronic console, whereby an ergonomic touchscreen provides easy access for the press operator to manipulate all press functions. As well, KBA added a very large visual screen of its own manufacture, so that operators can easily see what is going on in the Rapida 106. 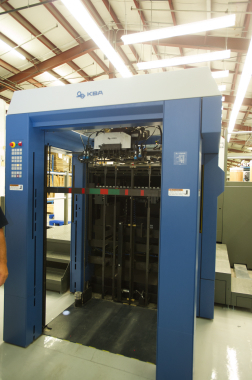 The screen also features what KBA calls a live-image QualiTronic ColorControl—an inline color measuring system to ensure print integrity is maintained throughout the print run. The QualiTronic ColorControl utilizes a camera visual system that is integrated directly into the press using LED illumination to allow the operator to check in-time ink density measurements in control strips, which can be positioned at either the front or center of the paperboard sheet. 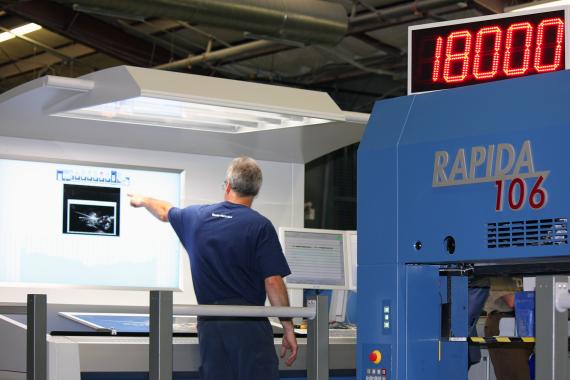 When the printing starts, the control strips are scanned directly in the press, and the measured solid densities are presented on the screen in a live graphic display. These measurements are used as a basis for fast, dynamic inline color correction. After the measuring system is set up, all measuring patches are scanned on every printed sheet, right up until reaching maximum production speed. The first setting corrections are realized immediately after the job start—with a control cycle measuring every single sheet and then adjusting every 10th sheet to ensure a perfect print run. At the other end of the Rapida 106 lie the feeder and infeeder sections, which, along with everything else on the press, made a big impression on Skinner. After the blanks on pallets are placed within the DriveTronic feeder that is controlled via four servo-motors, the continuous, stepless pile lifting of the blanks into the press is performed smoothly thanks to automatic: speed compensation; format setting; pile side-edge alignment; pile-height sensing and skew-sheet correction at the feeder head; and anti-static sheet loosening via air separation. Electronic sheet deceleration ensures optimum sheet arrival speed is achieved at the front lays of the infeed section. “The swing infeed accelerates the sheet smoothly in towards the feed drum, while the DriveTronic Infeed provides motorized remote adjustment for the complete infeed system,” explains Frank. Ingersoll added the optional automatic pallet changer with safety light curtains for the feeder section of the Rapida 106 printing press. Universal gripping system for maximum holding force. 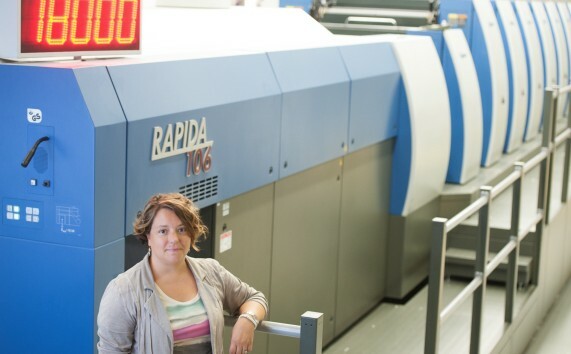 “It really is an amazing press—so much so that days after our open house event celebrating the Rapida 106 at Ingersoll Paper Box, we had customers knocking on our door to do business with us, and more continue to follow,” Skinner recalls. A few months before the KBA press was installed at Ingersoll Paper Box, the converter purchased a new platesetter system, the model Avalon N8-22 and Elantrix 125 SX, from Agfa Graphics. “We used to purchase plates externally until six months ago,” says Skinner, “and then we’d have to store them. The EXPERTFOLD 110 A-2 high-speed folder-gluer manufactured by BOBST utilizes the unique AccuBraille application system to apply the Braille language codes onto the paperboard packaging. 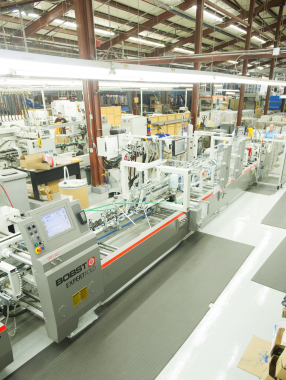 In May of 2011, Skinner made a significant purchase from BOBST, installing a new BOBST EXPERTFOLD 110 A-2 high-speed folder-gluer that Skinner says replaced some older antiquated equipment, while significantly increasing throughput capacity. To better optimize the EXPERTFOLD 110 A-2’s performance, Ingersoll Paper Box purchased a BOBST Handypack GT semi-automatic collection table for collecting and packing cartons, along with a VCX Gluing and Quality Assurance glue system option from Valco Melton—ensuring optimal quality control for the glue patterns and application of the Resicol X-697 Blue adhesives supplied by Halltech Inc. Even three years later, Skinner is still quite excited about the EXPERTFOLD’s unique capabilities, notably the BOBST AccuBraille application system that can add Braille to the on-package information to be read by visually-challenged customers. The Braille messaging on the cartons is created when a metal band with raised nodules is added to the EXPERTFOLD to apply pressure to the metal band as each paperboard carton passes by. After each carton has the Braille messaging applied, a Valco Melton CaptorT system verifies the information, using high-speed CCD (charged-coupled device) camera technology and custom lighting to produce over 10,000 images per second of the carton area. The image analysis algorithms and system software evaluates the image instantly, identifying defects like faulty cartons, incorrect Braille messaging, or improper adhesive application. Valco Melton’s OT-120 control package touchscreen data entry system uses simple pictograms and market-specific program symbols for fast set-up and changeover on the EXPERTFOLD machine. The BOBST EXPERTFOLD folder-gluer utilizes a Schneider Electric power and control panel, Baumüller servomotors, and Festo pneumatic components. • a Mx12 ink formulation and dispensing system manufactured by GFI Innovations, Inc. and maintained by Sun Chemical via Sun’s GFI ink dispensing program, with Ingersoll being the first sheetfed printer to sign up to the program. • the MK420Q MINI high-speed/precision carton inspection system from Masterwork Graphic Equipment which uses four high-resolution CCD cameras for the detection of defects down to 0.2×0.2-mm at speeds of 80,000 units per hour. “There’s that old adage that ‘sometimes you have to spend money to make money’, and that’s true to a certain extent,” Skinner reflects. “I think it’s imperative that when money is being spent, it should be well-spent on things that will not only improve the quality of life for the employees, but also enable the company as a whole to create something that separates us from the competition,” she asserts. 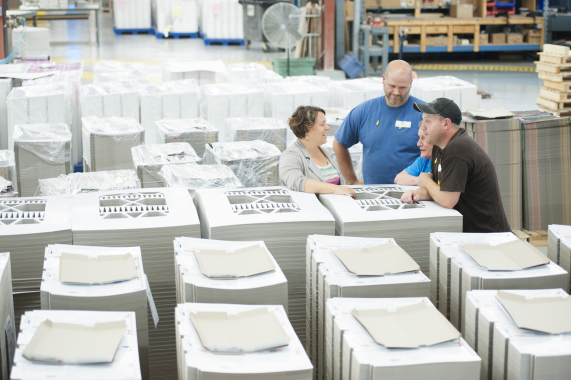 Ingersoll Paper Box president Sarah Skinner (left) chats with employees amongst rows of completed print jobs.